There is no change to the names in the top 10 Bermuda Klout rankings but the deck was shuffled with Bernews moving up five spots with a five-point gain. The media company joined Collie Buddz on joint third. WWE and FOX Business commentator John Layfield remains number one since our last report in June, but his score dipped one point to 84. Singer songwriter Heather Nova moves up to second as the Bermuda Tourism authority slipped to fifth. Joining the BTA on 74 points is Premier Michael Dunkley and PowerGirl Trina. Shari-Lynn Pringle and Don Burgess are tied for eighth with Bermemes locking down the 10th spot. Joining the rankings this month for the first time this year are the Royal Gazette [11th], Gosling’s [15th], Nhuri Bashir [29th], Courtney Bushner [34th], and Bermynet [34th]. Rejoining the Top 50 include the Fairmont Southampton [26th], Graham Maule [34th], Susan Thomas [40th] and Dudley Freedom [40th]. 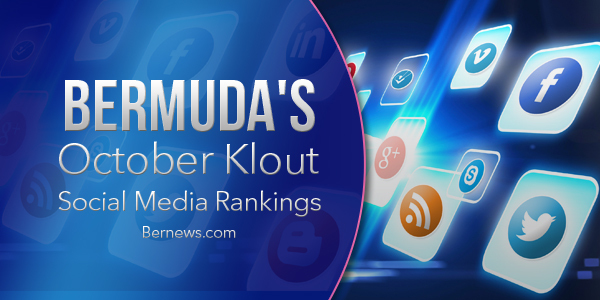 The next Bermuda Klout rankings will be in January. All scores were recorded from October 8-9, 2016.